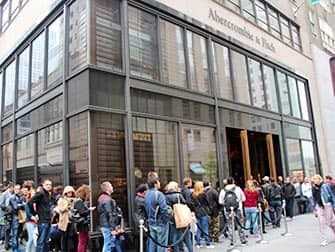 Abercrombie and Fitch (or A&F) is one of the stores in New York that is very popular around the world. In Manhattan, there are two stores, including one flagship store. However, it is important to know when to go. 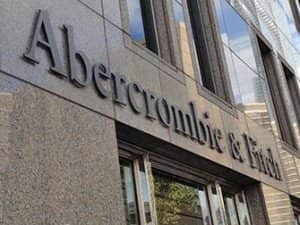 Abercrombie and Fitch is the store where the music is playing so loud that you will not be able to understand anyone speaking and you will be greeted at the door by the women wearing bikinis and bare-chested men. This Canadian brand is extremely popular with the young crowd. Abercrombie and Fitch also has a second clothing line called Hollister. Right by the flagship store for Abercrombie and Fitch on Fifth Avenue is a Hollister store. The other location is at the corner of Houston Street and Broadway. 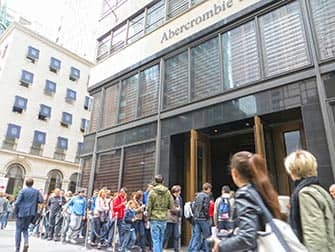 Eric’s Tip: The Abercrombie and Fitch store on Fifth Avenue is the shop where everyone goes to. It is not unusual to wait in line for 30 to 45 minutes just to enter the store (see photos below)! It is especially busy on Saturdays and Sundays. Make sure to go either early in the day or later. Or go to the second Abercrombie and Fitch store, because there is never a line there. The Abercrombie and Fitch stores are hard to recognise from the outside, because of their low-key exterior. Good luck!